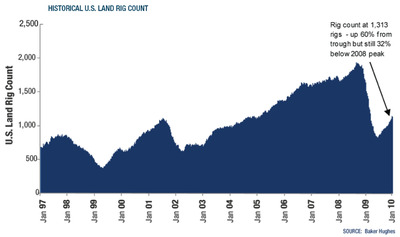 Here’s another sign of capacity tightening in the U.S. — According to Rig Zone there are 456 rigs drilling for oil in the U.S. right now, which is more than any time in over a decade. Natural gas drilling activity is up as well, but by less than oil is. The optimistic outlook we highlighted late-last year may have actually been on the conservative side given the pace of the recovery so far. In fact, over the last four months, the U.S. land rig count has increased more rapidly on an absolute basis than in any other four-month period over the past decade. Furthermore, the rig count has only posted weekly decreases four times in the 37 weeks since bottoming. Frankly, the magnitude of the improvement in recent months has exceeded the expectations of many industry observers, ourselves included. Overall, the number of active rigs has soared 60% from its 2009 bottom, and now stands at 1,313. 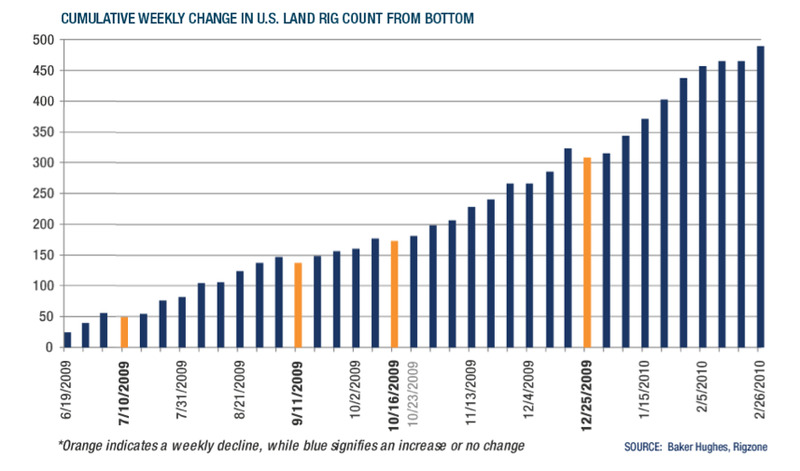 Rig Zone believes this surge in activity could moderate, according to their Q1 2010 report, but the massive rebound since mid 2009 probably means that a solid recovery is underway in this space.